It is shocking that Sam Ehlinger is not owned in over 50% of CFF leagues yet. After leading the Longhorns to a 48-45 victory over Oklahoma, he ranks among the top ten signal callers. He scored over 45 fantasy points on two aerial strikes and three rushing touchdowns versus the Sooners. For the season, the dual-threat Texan has passed for 1,499 yards, rushed for 225 yards and totaled 17 touchdowns. He has tossed a program-record 163 passes and not been intercepted. "I think it's just the experience and growing in situations where I don't need to force the ball necessarily and understanding the game and understanding what we're trying to do," Ehlinger stated. CFF diehards are overjoyed that the Texas triggerman has grown into a weekly starter. Grab Ehlinger now as the Longhorns are likely to be in a weekly shootout the remainder of the crusade. For three consecutive weeks, Peyton Ramsey has produced over 20 fantasy points, attempting over 40 passes in each game. The Hoosiers have won three of five contests behind Ramsey as he grows into a weekly starter. Against the No. 3-ranked Buckeyes, the sophomore signal caller threw for 322 yards and three aerial strikes. “He’s a tough, hard-nosed kid,” Coach Tom Allen said after the game. “He’s got confidence. He’s got poise. He’s got grit. He’s becoming a better passer. He’s really accurate. He throws a very catchable ball. He’s a warrior out there. He took some hits and bounced back.” Ramsey is the twenty-ninth ranked quarterback in CFF with 11 touchdown passes and two rushing touchdowns. He has completed over 66% of passes for 1,361 yards. With many teams on byes during the next three weeks, the Hoosiers’ quarterback is well worth picking up. Against Nebraska on September 15, B.J. Smith rushed for 70 yards and two touchdowns but remained invisible in the CFF universe. Over the past two weeks, the junior has become a must start with consecutive 100-yard performances and four touchdowns. For the season, Smith has gained 473 yards and reached the end zone eight times. He averages 6.5 yards per attempt and over 18 fantasy points per game. During his first two seasons on campus, Smith sat behind Jordan Chunn and Josh Anderson. At 5-foot-9 and 190 pounds, the junior outworks teammates and plays with a lot of heart. In the next two weeks, Troy travels to Liberty and South Alabama, which are favorable matchups for the Trojans’ ground game. Acquire Smith and be confident inserting him into your lineup. Coach Chip Kelly’s first season on campus is not going well. The Bruins are winless after five games, and the offense is stuck in neutral, scoring only 92 total points. Injecting a UCLA back into lineups may not win a CFF Championship, but Joshua Kelley has earned a roster spot and possible flex starter in leagues across the nation. In consecutive games, he has surpassed the century mark and snatched six passes. A transfer from UC Davis, the senior is the first Bruins’ ball carrier to rush for 100 yards in back-to-back games since Paul Perkins in 2015. “He’s definitely the most energetic, the most positive guy on the team,” Freshman quarterback Thompson-Robinson said. “Coach (Chip Kelly) made a reference to him earlier this week, (saying) energy is a choice. So he definitely brings that, and I think it sparked everybody up this week.” The Bruins offense played well against Washington—the best defense in the Pac 12—with a season-high 422 yards, and the remaining schedule provides some tasty matchups for Kelley and the ground game. Over the past two weeks, Notre Dame quarterback Ian Book and receiver Boykin have become one of the best QB-WR duos in the country. The two have connected on 19 passes for 261 yards and three touchdowns while averaging 13.7 yards per reception. “…our chemistry is coming along. And he's such a good player, and I love throwing to him,” Book proclaimed when asked if he had a steadfast determination to target Boykin. I did not believe in the Notre Dame offense at the start of the season, but after watching the past two weeks, CFF managers can now participate in the aerial attack with Book throwing the football. At 6-foot-4 and 228 pounds, the senior towers over defensive backs and easily wins one-on-one matchups. The undefeated and sixth-ranked Irish faithful have visions of a CFP invitation, and Boykin will surely fly high the remainder of the season. While watching the Notre Dame-Virginia Tech game, Hokies home run hitter Damon Hazelton flashed along with Boykin. Both players are worth-while free agent acquisitions. A transfer from Ball State, Hazelton started seven games as a freshman and recorded 51 catches for 505 yards and four touchdowns in 2016. 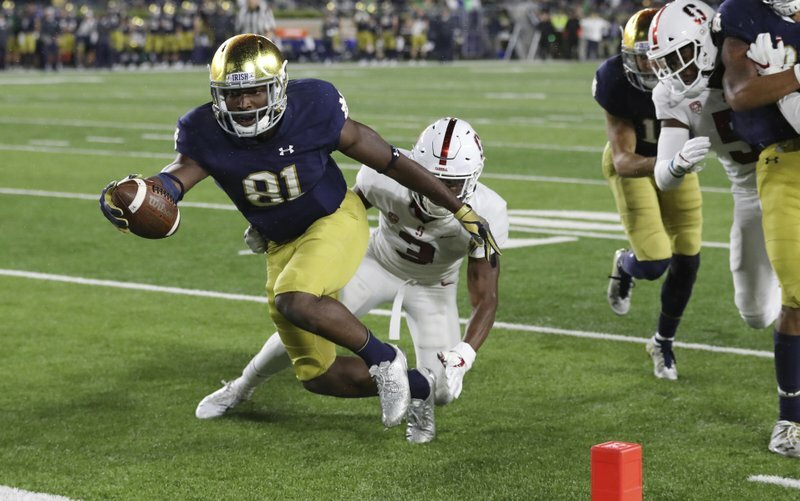 Sitting out last season, the redshirt sophomore receiver has recorded double-digit points in four consecutive games, including a season-best 25.1 versus the Irish. He has reached the promised land five time while averaging 17.7 yards per catch. According to Coach Justin Fuente, “Hazelton continues to improve. He needs to continue to work in practice to hone his craft. I think (QB Ryan) Willis and him have some chemistry,” which is music to the ears of CFF owners. At 6-foot-2 and 222 pounds, he is a good route runner with great hands and tremendous leaping ability. Either Boykin or Hazelton are tremendous waiver wire pickups this week.